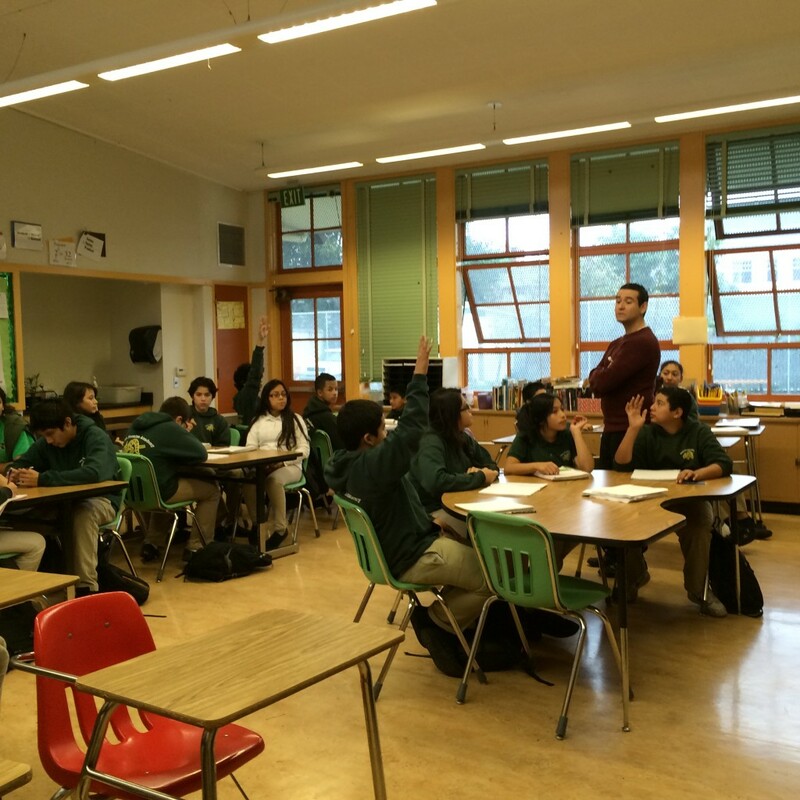 David Ramirez teaches math to small groups of 7th-grade students in his classroom at the Urban Promise Academy in Oakland. As teacher David Ramirez strode around his 7th-grade classroom at Oakland’s Urban Promise Academy, he was taking on a central challenge of the new Common Core standards: how to ensure that students who lack proficiency in English are able to benefit from a more language-based approach to learning complex math concepts. Most of the students in Ramirez’s class in this small Oakland public school are classified as English learners and most live in immigrant households. Their command of English ranges from minimal, to understanding parts of lessons, to speaking hesitantly. In almost all cases, their native language is Spanish, although the class also includes students whose first language is English. With 23 percent of California’s 6.2 million students classified as English learners, Ramirez’s challenge is one that faces thousands of other teachers across the state. Seventh-grade math students at Oakland’s Urban Promise Academy work on solving a math problem. Under the Common Core State Standards adopted by California, 42 other states and the District of Columbia, math teachers whose students have varying levels of English comprehension are using innovative ways to teach them math, including the vocabulary of math and ways for the students to discuss how they came up with their answers. The issue of making sure English learners benefit from the Common Core has been the subject of considerable research and discussion. One key finding is that much of what students learn can come from their interactions with fellow students in small group discussions where they analyze a problem, critique each other’s reasoning and find the best way to talk about it. That practice is on full display in Ramirez’s class, where students work in small groups much of the time. To bridge the language gulf between the math terms he must use in his class and the limited English proficiency of some of his students, Ramirez spends the first 30 minutes of each class just on math vocabulary. 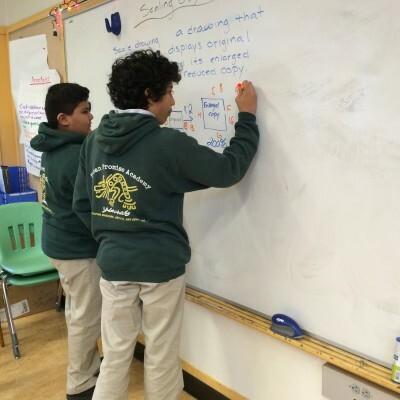 His lesson on a recent morning focused on “proportional relationships” between quantities, a key part of the 7th-grade Common Core standards. Ramirez focused on the relationship between two squares of different sizes that he had drawn on the board. He threw out concepts using words like “enlarge,” “reduce” and “scale,” and then illustrated each of them and challenged students to interpret the words’ meanings in groups as he listened to their discussions. Teachers use other strategies to help English learners understand terminology that may be out of their reach. 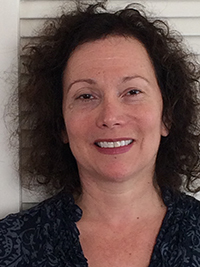 For example, in a math problem that is written in a narrative form, teachers may tell English learners to circle words that are repeated often in the problem, said Crystal Hoffmann, a project specialist with the Kern Unified High School District who trains teachers to work effectively with English learners. In groups, Hoffmann said, students focus on the importance of the circled words, talk about them and figure out their meaning. Those small group discussions – a major element of the Common Core’s commitment to collaborative learning – are key to helping push students. Students who are newer to the English language are not always able to verbalize the reasoning behind their answers, said Jeffrey Grisham, a 5th-grade math teacher at Kennedy Elementary School in Santa Ana. Grisham makes sure that groups include a mix of students – English learners who sit alongside native and fluent English speakers and those who excel in math. “The English language learners have learned how to express ideas by listening to the conversation of the other students,” Grisham said. Martin Perez, a 4th-grade teacher at Kennedy Elementary, agreed, saying that the small groups may be the only way that a student struggling with English feels comfortable to speak up. Perez recalled one student in a small group who talked about math concepts using a combination of English and Spanish. Perez, who understands Spanish, can listen and gauge whether her reasoning is faulty or on track. “She struggles, but when I hear her explaining something, it shows she’s going through the cognitive steps to get through to the answer,” Perez said. Her test scores also show him that she’s picking up the math concepts he overhears her verbalize. More-proficient English speakers may help those with less English understand math concepts. But Hoffmann, who coaches high school teachers working with English learners, said learning the language of math or any other subject is a challenge for many students – not only those who are learning English. The Common Core standards require that math teachers spend substantially more time helping students than in the past, Perez said. “The English language learners have learned how to express ideas by listening to the conversation of the other students,” said Jeffrey Grisham, a 5th-grade math teacher at Kennedy Elementary in Santa Ana. Ramirez, the Urban Promise Academy teacher, said the new standards allow him to apply math problems to the realities of everyday life experienced by his students – something he yearned for when he studied math in school. For example, in a lesson on how to calculate the rate at which something occurs, he asked his students to look at school dropout rates by race, which hit home for several of them. Others mentioned that members of their families do not have high school diplomas. Why is it that there’s little to nothing ever written on this forum about the average kid who isn’t underperforming or only speaks English and is just trying to get an education in a system that seems to care llittle for her efforts to thrive and excel – a system that seems to devote all its energy to underperforming students? Public education has a bad name not due to its financial troubles, but due to the correct public perception that its mostly funding the teaching of basic literacy to the detriment of excellence. Compensatory education should be a contractual obligation between the State and the low performing student. That student will receive an SC grant if s/he keeps up her end of the bargain with extra effort. We cannot afford to deprive students of an adequate education by throwing money away on those who don’t want the opportunity to learn. Ed source – I know you want to be the champion of the underprivileged, but there are now very few students left in public education who are not underprivileged by the system itself. Why should higher performing kids have to sit in classes double in size so we can fund lower performers who largely fail to progress despite the additional resources? Does Ed Source not care about anyone else except those that are failing? Very true. The average is the most important and impactful. The top will do fine anyways and the bottom, probably not with all the help in the world, look at DC they triple what we spend and the kids don’t respond with hard work or results. The average is the true test. Makes sense, but interesting contrast between slang and academic language.